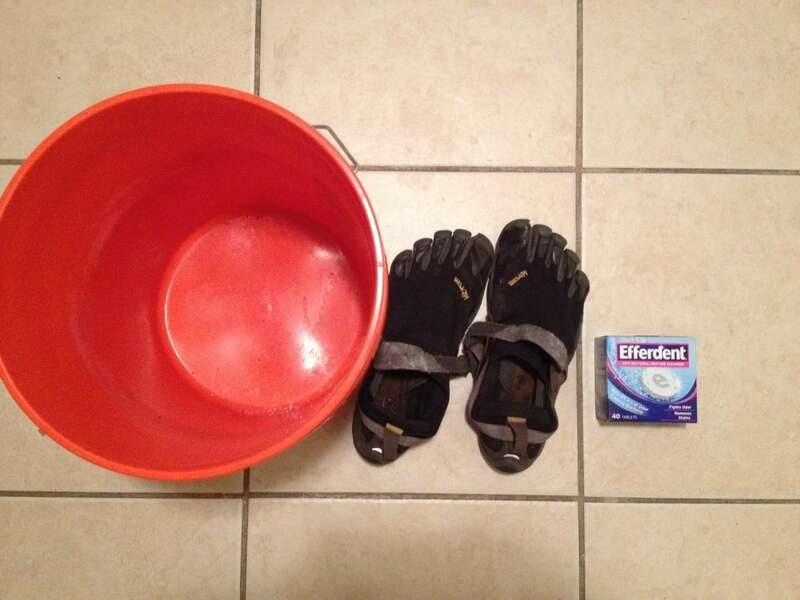 Vibram Five Finger shoes are awesome for running, hiking, and looking weird around town. Unfortunately, toe shoes start to smell if you don't wear socks with them every time you wear them. 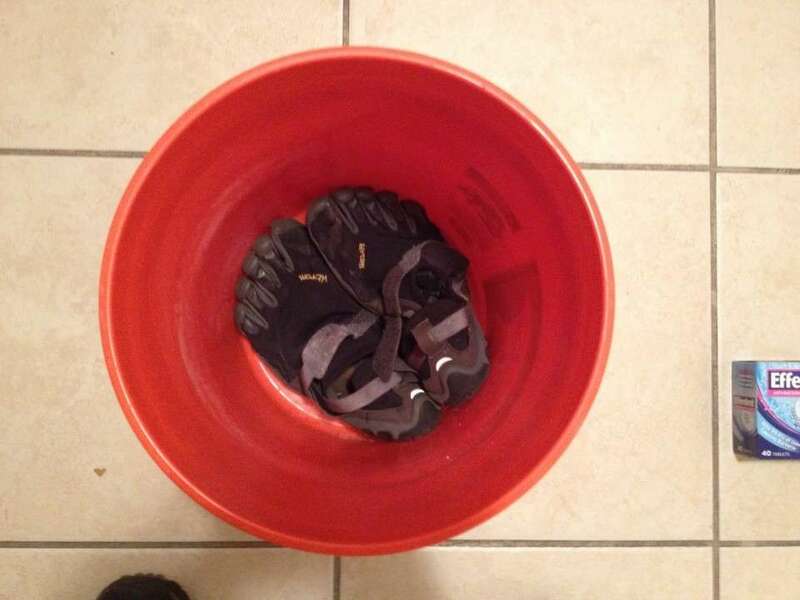 While Vibram claims that the shoes are machine washable, you will ruin them if you wash them repeatedly. I also threw my gym gloves in there while I was at it. If you've never washed your gym gloves before, I would clean them separately from your toe shoes; most gym gloves (even leather ones) will release dye the first time they're washed. This could taint your pretty toe shoes. Use a weight (I used a ceramic kitchen bowl) to keep the shoes from floating. 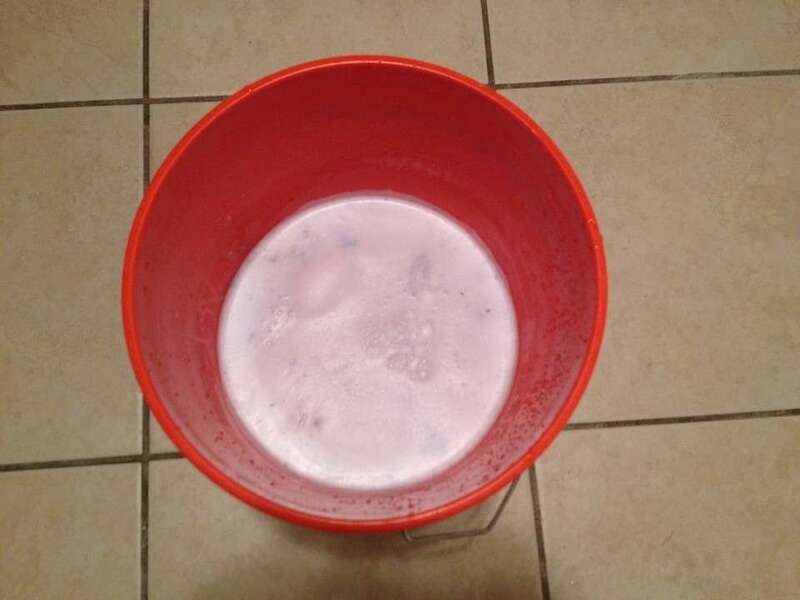 Fill the bucket with hot water until the shoes and weight are completely covered. Drop denture cleaning tablets into the water. I used 16 tablets just to be safe -- the tablets are really inexpensive and I wanted to be sure that my shoes got really clean. Place the bucket somewhere out of the way and let it sit overnight. 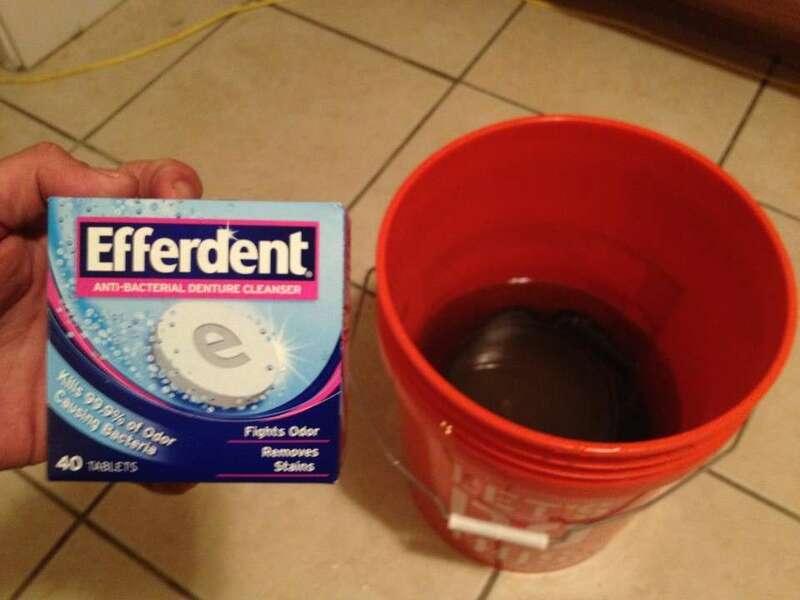 Denture cleaners are minty and smell nice -- keep the bucket away from pets. Though the tablets aren't toxic to humans, your dog may not have a great time after drinking a bunch of dirty denture tablet water. 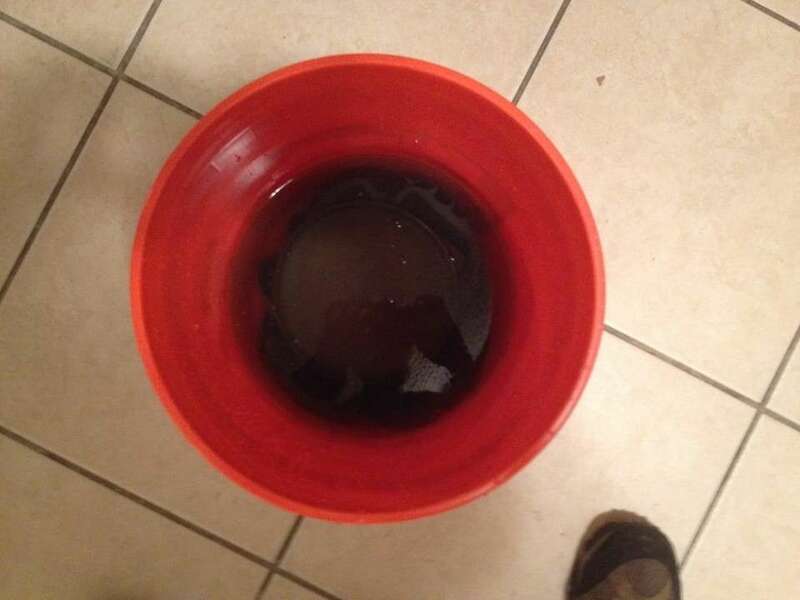 Remove your shoes from the bucket and run them under a faucet. This will thoroughly remove any denture cleaning residue that might exist. - Hang them in front of a powerful fan for a few hours (this is what I did). - Hang them outside in an area where a nice breeze exists. - Air-tumble dry them in your dryer on the delicate setting; be sure not to use a large amount of heat as this may shrink the material. - Place them on the floor directly in front of your refrigerator; this method is only effective for certain types of refrigerators that push air and heat out beneath the front doors. The best way to keep your toe shoes clean moving forward is to always wear toe socks with them. Toe socks aren't terribly expensive and really pay off in the long run. There's nothing like a fire pit to bring friends together! I decided to make a budget-conscious fire pit and was able to accomplish the feat for about 75 bucks. Here's my build guide. I love doing outdoorsy things with my dog and often it's dark before we return. I decided to make an LED dog vest since it allows her to wander further away while still being visible.